A B.C. ‘Pastafarian’ who wears a colander on his head has been stripped of his driver’s licence, after he repeatedly refused to take off the holy headgear for his I.D. photo. 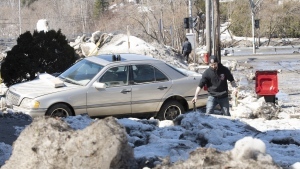 The nearly year-long conflict between Obi Canuel, 36, and the Insurance Corp. of B.C. 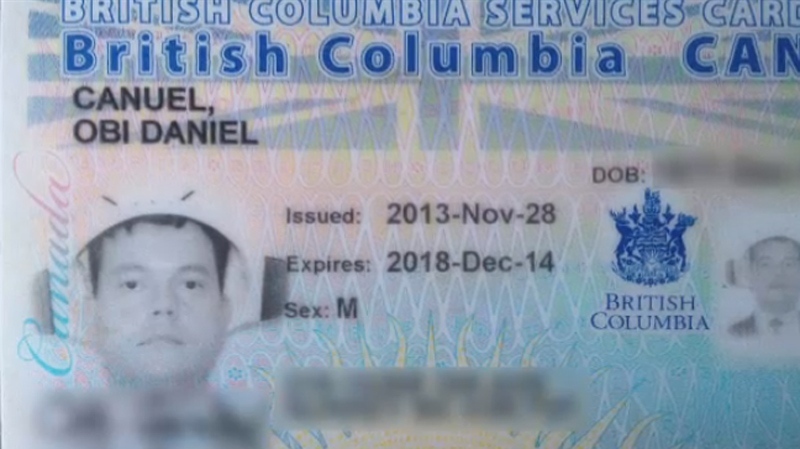 came to a boil Friday, when ICBC refused to renew Canuel’s licence unless he went hatless for his I.D. photo. Canuel had been driving with a temporary paper licence for months after clashing publicly with the insurer in August. Canuel, who is an ordained minister in the Church of the Flying Spaghetti Monster, says it’s his religious right to wear a colander for his photo, just as members of other faiths are allowed to wear turbans and other coverings for their photos. Canuel says his headgear is protected by the Canadian Charter of Rights and Freedoms, and he should not be forced to take it off. Canuel had been driving under a series of temporary driver’s licences while the ICBC considered his colander request. But those temporary licences expired on Friday. Now, Canuel is noodling his options – and doing a lot more walking – as he faces life without a licence. 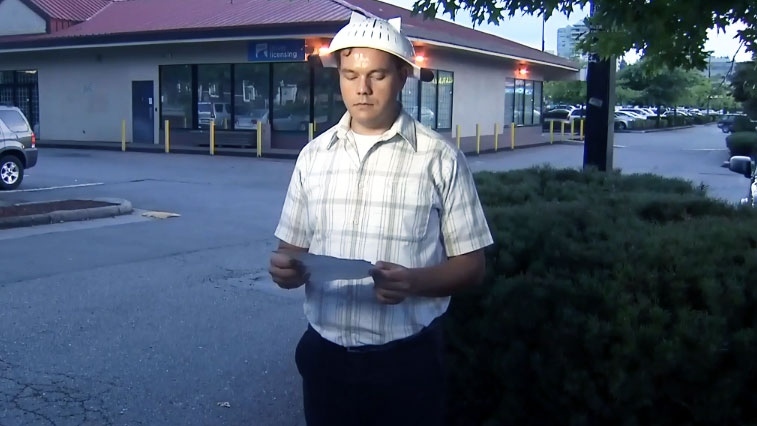 The ICBC says Canuel was unable to prove the colander is a mandatory part of his religion. Canuel was allowed to wear the colander for his B.C. Services I.D. card photo, taken late last year. The Church of the Flying Spaghetti Monster was founded in 2005 as a response to Christian perspectives on creationism and intelligent design. It allegedly sprang from a tongue-in-cheek open letter to the Kansas School Board, which mocked educators for teaching intelligent design in schools. The letter’s author, Bobby Henderson, said if the world was created by an all-powerful being, there is no proof that being was the Christian God. The world could just as easily have been created by a flying spaghetti monster. The Church of the Flying Spaghetti Monster charges US$30 for a Canadian to become an ordained minister of the religion. The United States recognizes Pastafarianism as a religion. In January, a town councillor in a New York town was sworn in while wearing a colander on his head. “It is a strange thing when the West Coast of Canada is somehow less liberal than the United States,” Canuel said. Canuel says he will continue his fight against ICBC, but he is not considering legal action at this point. “I would like to talk with my supporters and meditate upon the meatballs, and perhaps ICBC will change their mind,” he said. He added that he’s been accused of wasting taxpayers’ time and resources, and he does not want to annoy people further. “His Noodliness would prefer if we not dwell on the negatives,” Canuel said. A few weeks after his story broke in August, Canuel addressed his Pastafarian supporters in a video posted to YouTube. “There’s a lot of discussion going on out there about religious freedom and the limits of state accommodation, and I think it’s good that these discussions are happening,” he says in the video. He then thanks his supporters and explains that his Pastafarian beliefs are not delusional. Obi Canuel is shown outside the ICBC offices in this file photo from Aug. 14, 2014. Obi Canuel is shown wearing a colander on his head for his B.C. Services ID photo.